Part of the allure of kayaking is the sense of freedom they provide the paddler and the ease with which kayaks are paddled. Both of those qualities are inherent in paddling solo kayaks, that is kayaks meant to be paddled by one person. Tandem kayaks are a whole other story. They are longer, more difficult to turn, and much of what happens in a kayak meant for two is dependent on the synergy between the paddlers. Here are some tips on how to paddle a tandem kayak should you and your partner find yourselves in one. Besides the advent of plastic to the kayak manufacturing world, one of the biggest reasons kayaking has taken off in the last 30 years is the ability to paddle kayaks solo. Canoes are difficult for beginners to paddle alone so they are usually sold or rented as tandem canoes meant to be paddled by two people. This has lead to many great arguments out on the water that can still be seen today where two people are trying to steer a canoe out on the water. 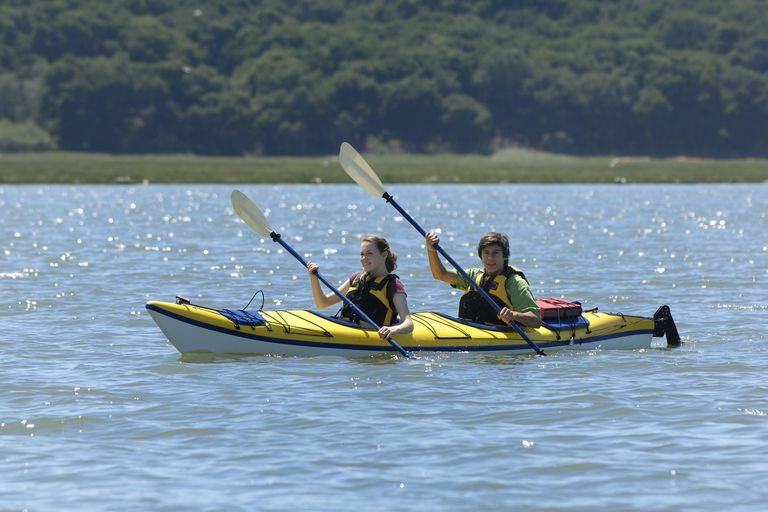 The availability of the kayak with its double-bladed paddle helped people to avoid these on water disagreements by giving everyone their own boats to navigate. That being said, tandem kayaks do exist and are often available to rent. It would seem that the same difficulties that befall tandem paddlers in a canoe shouldn't affect those in a kayak since each paddler in a kayak has a double-bladed paddle. That isn't, however, the case. Tandem kayaks have the same propensity to zig-zag all across the lake and river when paddled by two people. Also, due to the proximity of the paddlers within the kayak, it is very easy for tandem kayakers to hit each other's paddle if the strokes are not timed properly. This is something that tandem canoeists usually don't face since there is generally more distance in a canoe between the paddlers and due to canoe paddlers being necessarily shorter. The way to avoid these paddle collisions and to get the kayak to paddle straight is to learn to time your strokes by remembering these tips. Since the paddler in front can't see the paddler behind him or her, it only makes sense for the paddler in the bow to control the paddling rhythm. This means the paddler in the front should just paddle freely. The paddler in the front should not, however, attempt to steer the kayak as it will have little effect on the boat and only serve to mess up the rear paddler. Just paddle forward normally unless the paddler behind you suggests something different. The paddler in the stern of the kayak has the full view of what is going on. He or she should, therefore, attempt to match the strokes of the paddler in front of them. By paddling in synchronicity like this, the kayakers paddlers shouldn't cross or smack each other and the kayak should travel relatively straight. If the kayak starts to veer one way or the other, the kayaker in the rear should still keep in rhythm with the front paddler but should use a more powerful and exaggerated forward stroke on the side opposite the direction you want to go. So if the boat is veering to the right, take a powerful stroke on the right side to make the boat correct to the left and vice versa.